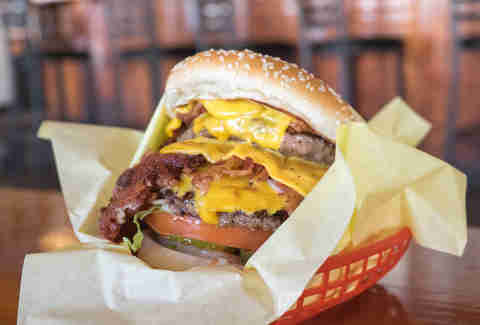 San Diego is home to many excellent burgers, but few make an impression equal to the seven mammoth beef and bun creations outlined below. All of these glorious (and more than a little dangerous) burgers are big enough to haunt your dreams (and possibly nightmares). From full-pounders named after mythical sea creatures to plus-size creations stuffed with bacon and mashed potatoes, these seven giant burgers are waiting to meet you. 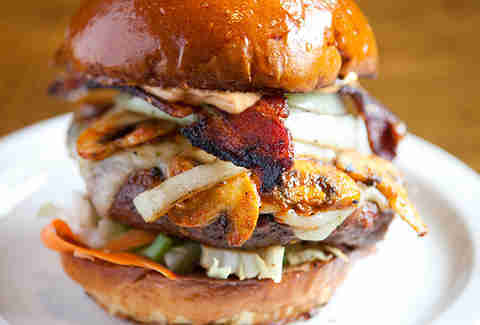 Designed by bar owner Ingrid Alvarez and her husband Yuseff Cherney (COO and head brewer of Ballast Point Brewing & Spirits) during a Bloody Mary-filled brunch, this burger behemoth stars a 1lb patty of Angus chuck topped with grilled onions, four strips of bacon, and about a cup of blue cheese. Instead of the standard-issue bun, it’s sandwiched between two PB&J sandwiches -- sriracha-infused peanut butter and strawberry jam on toasted bread, that is. It’s savory, it’s salty, and it’s sweet, but most of all, it’s shockingly delicious. Made with a 10oz patty of hand-formed Kobe, filet mignon, and prime rib, this burger from The Patio delivers on size and quality. On top, there’s Huntsman cheese (a gourmet variety that looks a bit like layer cake), Iberico ham, a sunny-side-up duck egg and fancy veggies (heirloom tomatoes and frisée). 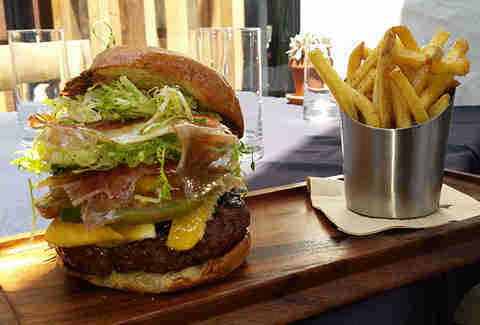 With the black truffle brioche bun and side of fries taken into account, it could very well be worth the $30 price tag. This deeply satisfying burger that landed on our round-up of San Diego bucket list foods weighs in at just shy of a pound of meat, bun, and toppings. If you want to make it more manageable, ask for your onions grilled (which significantly decreases the burger’s height). For the full experience, fries (or frings) are also recommended. Guests are encouraged to build their own burger by piling on everything like beer-battered jalapeños to garlic rosemary Parmesan bacon at this craft beer and burger joint. 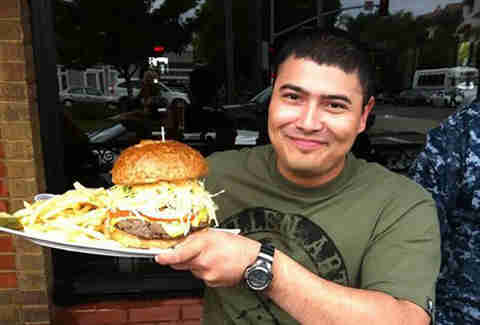 If you really want to go big, start with a 1lb meat or veggie patty. There are nine options to choose from, including bison, turkey, and the signature 50/50 (half bacon, half beef). 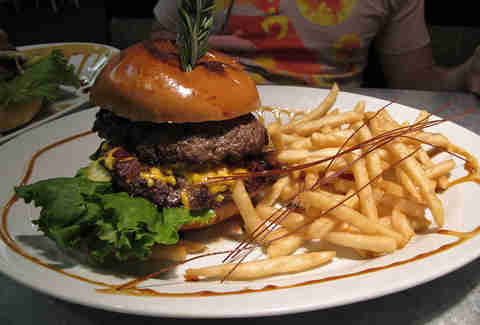 Hash House is all about big food, so it’s no surprise it also serves some of the bulkiest burgers in San Diego. 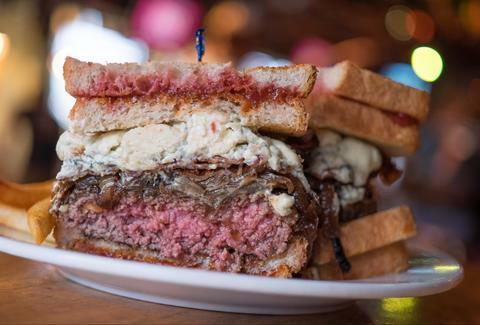 Head here to try everything from bacon and mashed potatoes to roasted red pepper and griddled smoked mozzarella sandwiched between two half-pound patties. The rosemary sprig stabbed through the bun does an impressive job of holding everything together, but plan on fork and knifing it -- this isn’t the type of burger you can hold in your hands without serious spillage. The regular burgers at Nicky’s are a perfectly respectable size, but they look downright puny next to this 2.5 pounder that’s yours free (provided you can clean your plate in under 30 minutes). Made with 2lbs of Brandt beef, American cheese, Rotten Sauce and a super-sized bun (plus fries on the side), it’s not an easy beast to slay. Judging by this photo gallery, quite a few contenders have attempted the feat. Even if you lose, at $24.95, the burger is still reasonably priced, given its size and because Nicky definitely knows how to turn out a damn fine burger. 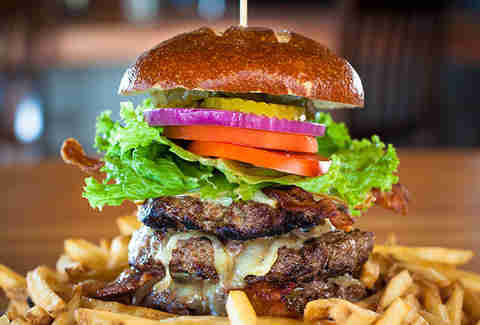 Lumberyard Tavern’s 4x4 burger is another fun and delicious way to test your stomach’s capacity. The pretzel-bunned burger features four half-pound patties, four slices of cheese, four strips of bacon, and a fried egg (plus lettuce, tomato, red onions, and pickles)... and oh yeah, a pound of fries. Take it down in 30 minutes or less and you’ll receive a personalized plaque on a special trophy marking your achievement, a commemorative T-shirt, and more. Fail and you’ll owe $25.